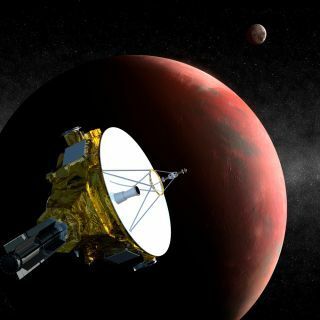 Artist's impression of NASA's New Horizons probe flying past Pluto on July 15, 2015. Mission officials are currently looking for objects that the spacecraft could visit after this historic encounter. Pluto may not be the end of the line for a far-flung NASA spacecraft. NASA's Hubble Space Telescope spotted a few objects that the New Horizons probe might be able to explore after it zooms past the Pluto system during a highly anticipated flyby on July 14, 2015. Mission team members are assessing the candidates now, to get a better understanding of their orbits — a difficult task that could take a few more months. New Horizons launched in January 2006 on a $700 million mission to study Pluto and its five known moons. The probe's flyby should return the first up-close looks at the dwarf planet, which is so distant and dim that it remains cloaked in mystery more than eight decades after its 1930 discovery. "Everything that we know about the Pluto system today could probably fit on one piece of paper," Stern said, adding that New Horizon's observations should provide "a bonanza for science in so many ways." But the New Horizons team has never been fixated solely on Pluto. Stern and his colleagues are also preparing for a possible extended mission, which would send New Horizons out to explore another object in the Kuiper Belt— the ring of frigid bodies beyond Neptune's orbit that includes Pluto. Finding another Kuiper Belt object (KBO) to explore has proven challenging, however. "These are objects that are much smaller than Pluto, and probably much more primitive in terms of their chemistry and their appearance," Stern said. "These are objects the size of counties, for example, not the size of planets. They're very faint." Indeed, mission scientists have spent about four years searching for post-Pluto targets, using some of the world's biggest ground-based telescopes. The hunt turned up some KBOs, but none of them was within New Horizons' fuel reach, Stern said. So the team applied for time on Hubble, which is always hotly contested. In June, the researchers were granted observation time on 200 Hubble orbits of Earth. The Hubble search is complete, and the New Horizons team is now going through the telescope's data. "Hubble has done a spectacularly good job, and has yielded literally hundreds of images of that part of the sky, from which we've found some candidates," Stern said. "We don't know if any of them, though, are within our fuel reach, and we won't still for some months, because we have to track them as they move in their orbits." New Horizons' fuel reach will apparently be a bit greater than the probe's handlers had originally envisioned. A trajectory-correction burn performed this summer was so accurate that an additional potential burn planned for January won't be necessary, mission officials said. "This is a good omen for our hoped-for Kuiper Belt flyby because each burn we can cancel saves a little fuel and makes the Kuiper Belt mission more feasible," Stern wrote in a mission update last month.